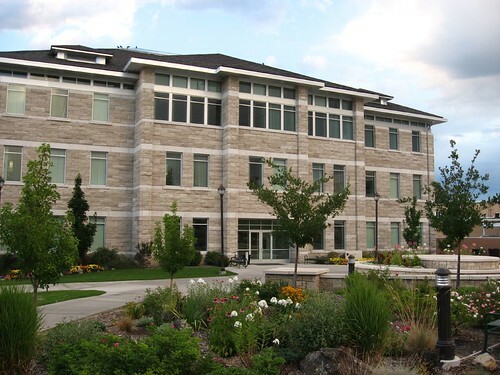 The campus sits on a hill overlooking the city of Rexburg and the Snake River Valley and includes nearly forty major buildings and residence halls on over 400 acres (1.6 km2). Off-campus facilities include a Livestock Center and the Henry’s Fork Outdoor Learning Center near Rexburg, the Outdoor Learning Center at Badger Creek in Idaho’s Teton Basin, and the Natural Science Center in Island Park, Idaho. The Teton Lodge and Quickwater Lodge near Victor, Idaho, are utilized as student leadership and service centers. The main campus includes a planetarium, an arboretum, wildlife museums, and a large family history center. The school also operates several athletic fields and facilities around campus, which are now used as part of the Activities program, an alternative to intercollegiate sports. Facilities include a baseball field, football and track stadium, tennis courts, as well as the John Hart Physical Education building, which with 4,000 seats in its main gym was used for athletic events, graduation, and concerts, and weekly campus devotional. The building also includes a small field house, pool, auxiliary gymnasiums, racquetball courts, and a workout area for students. On December 17, 2010, the BYU-Idaho Center was dedicated and opened to students. The 435,000-square-foot (40,400 m2) building contains a 15,000-seat auditorium and a multi-purpose area large enough for 10 full basketball courts.